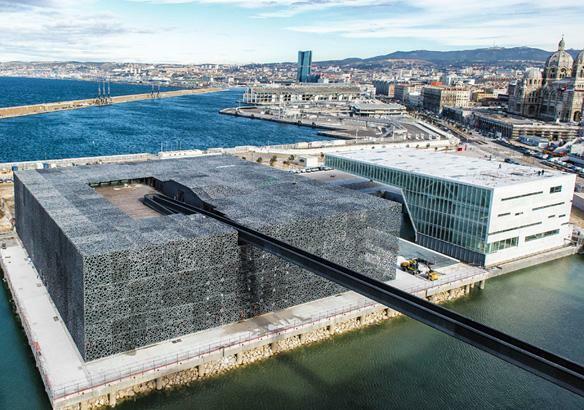 Following an international contest initiated in 2002 by the French Ministry of Culture, the winning team with the architect Rudy Ricciotti was assigned to design and realize the MuCEM (Museum of European and Mediterranean Civilizations) on the J4 jetty in Marseille. The chosen architectural concept is to realize a building with a distinctive modern structure, building that is both audacious and conscious of sustainable development by preferring the use of UHPFRC for the principal elements of the structure: tree-like columns, long-span beams, fishnet façade and roof and for the footbridge linking the structure with the Saint Jean fort. 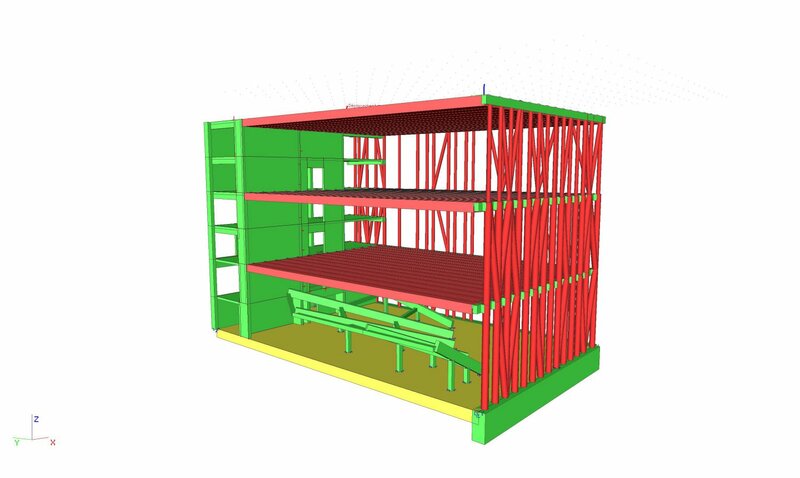 A large research work was necessary in order to integrate the UHPFRC elements to the structure of the building as these elements had to be prefabricated. The vertical load bearing elements reflect their structural function by their special shape developed together with the architect. 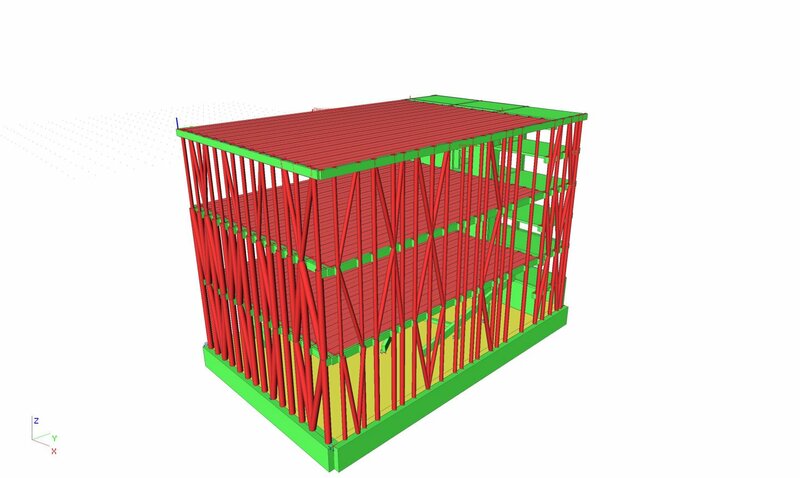 The connection of the columns to each other, to the foundation slab and to the edge beams of the floors is done with the use of post-tensioning that increases also the tensile resistance of the UHPFRC. The post-tensioning with sheathed greased strands starts from the bottom of each tree-column. Going upwards, the strands follow the multiple branches. The tensioning is applied progressively from the top, following a predefined phasing. The tree-like columns serve also as an additional façade bracing - this is achieved through groups of columns forming Ns and Vs. In the engineering design phase, following the decision to make the building earthquake resistant, dilatation joints were suppressed, edge beams for the floors have been post-tensioned to counter temperature effects, elements of the precast columns were pinned at the top and bottom by Freyssinet hinges, as the post-tensioning can pass trough, and most of the wind bracing was taken up by the central core. 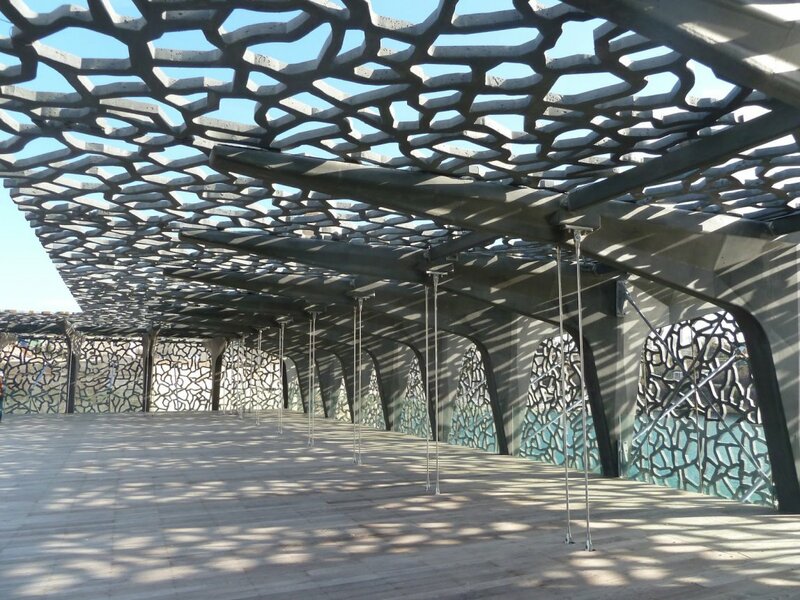 These free-standing sun-shading panels are structured from intertwined strands following the architect’s drawing. Each panel with the size of 6 x 3 m is juxtaposed to provide for load descending between the panels according to the continuous random pattern. The façade free-standing fishnets are supported on the foundations and horizontally held by pinned booms attached to the vertical posts of the curtain wall of the Museum. ​Twin I beams of 23.40 m span support the floors of the Museum exhibition rooms. The beams are precast and pre-stressed with bonded strands. The pre-stressing is calculated to be centered under quasi permanent loads in order to avoid curvature due to creep. To comply with seismic provisions, the beams were made of high performance concrete C60/75 instead of UHPFRC, while increasing their depth by 11cm. This footbridge with bearing railing has 3 spans of 21 m, 68 m and 30 m. Having the total length of 130 m, it consists of 26 segments in UHPFRC assembled using post-tension. The slender shape, straight in its plane and slightly curved upwards (41 cm) has 2 supports at each side for a free span of 82 m.
The deck formed by UHPFRC slabs with bracings of crossing diagonals is fixed to the segments to form the horizontal bracing. 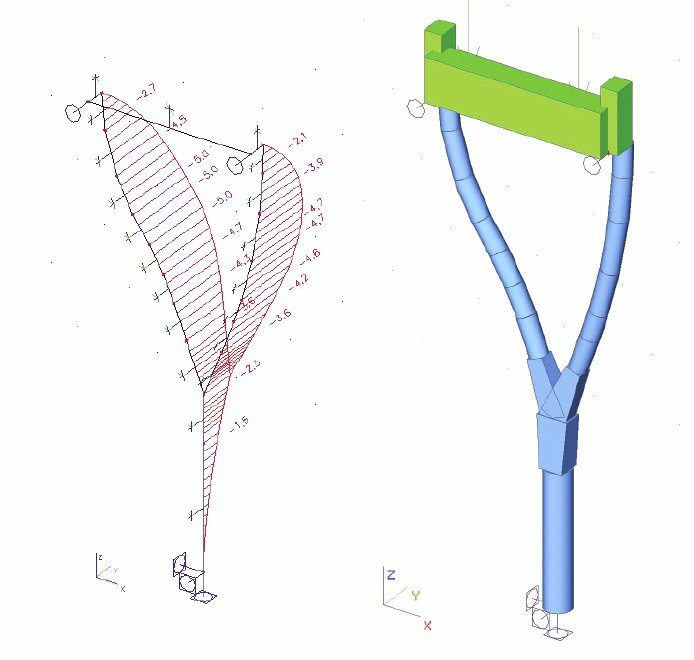 Advanced non-linear static calculations were performed for dimensioning of the columns, taking into account the real non-linear stress-strain behavior of UHPFRC. Real-life tests performed at the CSTB (Centre Scientifique et Technique du Bâtiment) on 3 straight columns and 3 shaped as “Y”, allowed us to characterize 3 French UHPFRC materials and to show the reasonably conservative result of the calculation. This project is also awarded by the American Concrete Institute in their annual ACI Concrete Convention and Exposition, November 9, 2015, in Denver, CO.! 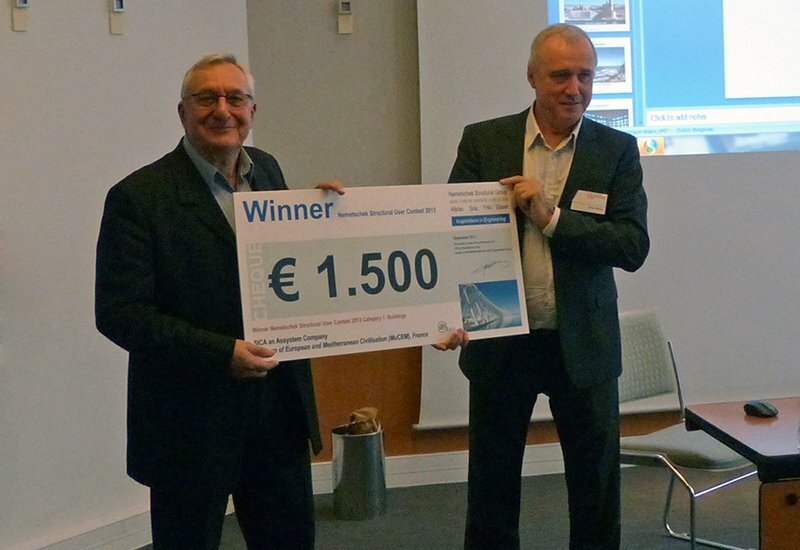 We were extremely fascinated by the project’s design and innovative use of the advanced ultra high performance fibre-reinforced concrete (UHPFRC) for nearly all the main construction elements, including a 130 m footbridge. The combination with advanced technology of prestressing material and the innovative façade creates an intricate, illuminated user experience from within the building.